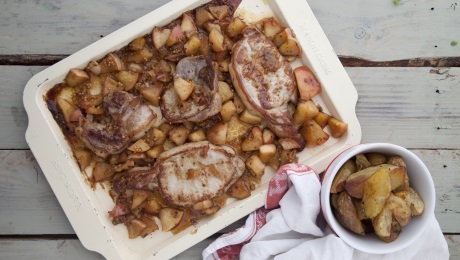 Pork and apple is always a delicious combination, perfect for all the family. Place the baby potatoes in a large pan of salted water and bring to the boil. Simmer on a medium heat for 20 minutes. Remove from the heat and strain, then slice the potatoes into quarters and place on a baking tray. Drizzle with some oil and season well. Place in the preheated oven for 30 minutes until golden brown. In the meantime, heat a large pan until smoking hot. Rub the pork chops with some oil and place on the pan. Cook, turning as necessary, until the meat is cooked through (cooking time will depend on the thickness of the chops; it will be cooked when the juices run clear when pierced with a sharp knife). In the meantime, heat 1tbsp olive oil and the butter in a second pan and add the onions, wholegrain mustard and apple. Cook on a medium high heat until softened and lightly coloured. Add the cider and stock to the pan. Adjust the seasoning and continue cooking until the apples begin to break down a little and the liquid has reduced by half. Serve the chops with the sauce and the baked baby potato pieces.